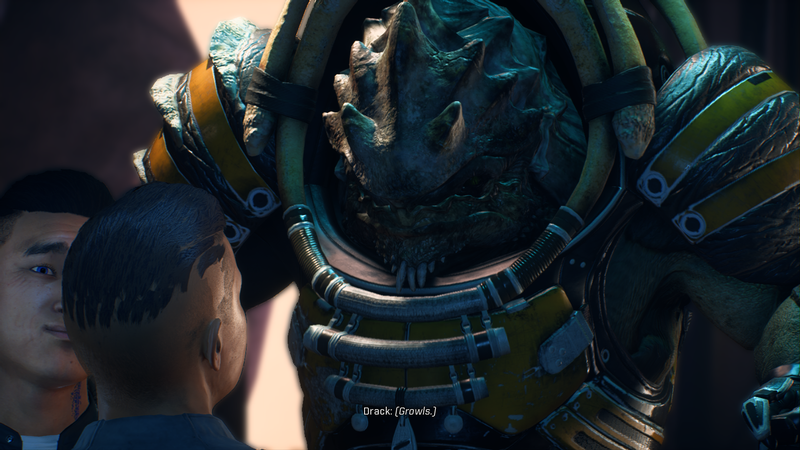 This is Drack, your Krogan squadmember. He’s a VERY old, sometimes grumpy warrior. And yes, I too can see how janky my character’s facial expression looks. While the game’s combat shines through and through, Mass Effect: Andromeda needs some serious polish before it can be fairly called a great Mass Effect game. You can check out a large list below of things I observed during my playthough. Or, if you’re looking for an in-depth analysis, Kotaku’s own review of the game provides an excellent, detailed look into what’s off & great about Andromeda. Mass Effect is a prominent sci-fi shooter RPG franchise made by Bioware, a company that pioneered a unique standard in the RPG genre by immersing players in worlds where your main character could have fully voice-acted, “cinematic” interaction with NPCs. 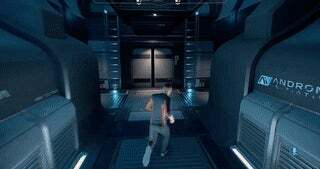 Mass Effect also offered galaxy exploration reminiscent of Star Trek. With in-game decisions that could affect the trilogy’s universe in small, subtle ways, the game’s charm was supplemented by a gorgeous sci-fi backdrop that’s hard to find in other games. Also impressive was how each sequel vastly improved upon the previous game. The differences between ME 1 and ME 3 are like night and day. While the original Mass Effect trilogy was generally well received (with a general consensus that ME2 was the pinnacle of the trilogy), it’s had its fair share of controversy, particularly in how your Commander Shepard’s story ended in ME3. I think most gamers can agree on one thing: the trilogy was one wild journey, even if the final destination may have ended up being lopsided. Enter Mass Effect: Andromeda, a game many years in the making and with BIG shoes to fill. It’s set 600 years after the events of ME3, where the original Milky Way species attempts to a find a new home for themselves in the Andromeda Galaxy. Early on, you play as one of the Ryder siblings waking up from cryosleep, finding out that the human “ark” ship hosting 20,000 colonists is apparently the only ark ship to show up in the galaxy. You also find out that many of the “golden worlds” thought to be habitable are apparently not so habitable, with some bad guys apparently focused on wiping out your species’ existence. This premise quickly gets you started with the tutorial missions, thereby launching your Ryder’s adventure. When you exit the Galaxy Map, you get a beautiful close-up of wherever you last traveled to on your ship’s bridge. My take is based on the PS4 release copy of the game (with no patches or updates applied). I played the single player campaign on NORMAL (or as I like to call it: “Average”) difficulty. It took me exactly one week to beat the campaign and reach a 94% completion rate on PS4. The only things left for me to do are “tasks”, requiring me to do something x amount of times (they are the REALLY boring sidequests not worth playing). While there is a multiplayer component to the game that I note in my observations, I am primarily focusing on the single player campaign. Without further ado, let’s see what I strongly think the game does right, and what it does wrong. Combat, by far. Not only is combat the best in the franchise, the game’s flexible combat system is up there with other great third person shooters. THAT’s how good it is. Having jumping/dodging/hovering maneuvers (using your jet or biotic powers). Verticality has added a whole layer of fun navigating your environment while killing bad guys. Cover system is SO well-done, it puts other shooters’ cover systems to shame. You don’t need to press a button to go into cover. You just go up to most walls/objects, and your character smoothly snaps to cover, providing excellent freedom of movement. Having the ability to switch classes/powers on the go AND being able to invest in all skill trees (combat, biotic, tech). Experimenting is so much fun (and encouraged). No longer are you locked to using one class in one playthrough. There’s a lore-friendly reason you can do this too. Diverse guns suited to your playstyle. Every gun has a unique feel & utility to them. Diverse melee weapons (for use with the Melee command) suited to your playstyle. Sound design is TOP NOTCH. Every weapon has a certain weight/punch to them. Fighting Remnant Architects is a blast. They’re the biggest enemy types you can find in the game. With excellent modding + augmentation mechanics, most crafted guns can use ME1-style heat sinks (shooting until overheating), having a GENEROUS reload speed/time. Ability to craft powerful armor pieces/weapons up to rank 10 AND add augmentations to them. Armor AND casual outfit color customizations. No more using a weak white+blue color scheme that the game’s marketing pushed. Black & red is where it’s at. There are multiple ways to get XP to level up AND leveling up is generous in this game. I got to level 60 in my first playthrough. Squad interactions/banter (outside of combat). They feel the most alive & dynamic in this game interacting with each other than in prior games. If you like to roleplay as a sarcastic, snarky character, this game’s for YOU! Vehicle driving (…when you get all the upgrades). The Nomad is an overall big improvement over the Mako. Unlocking “Forward Stations” that act as a free medbay, ammo resupplier & fast travel point. They reduce the inconvenience of traversing the large environments in the game. You can also change your loadout/squad members at these stations without needing to go back to your ship. Some specific stations even include Researching/Crafting new equipment. Pretty, diverse landscapes. Even if some DO look plainer and too similar to Dragon Age: Inquisition’s environments. Diverse, electronic club music (at different clubs & in your cabin’s playlist). Life support system provides satisfying tension. It becomes useless later on as you make hostile planets habitable. I think that’s a good thing, as you are rewarded a sense of safety when you no longer have to worry about it. Using your omni-tool to scan your environment (akin to the Arkham Batman games). It never gets old to highlight lifeforms or objects of interest. Aliens look FANTASTIC compared to humans. Height differences are emphasized to make aliens REALLY stand out amongst each other. Galaxy Map (zooming in on planets, systems) is as pretty as ever. There are multiple, streamlined ways to gather a lot of resources actively and/or passively (for the purposes of crafting weapons/armor). Having the option to send teams on Strike Missions to passively get some extra credits/rewards (or play certain missions yourself in multiplayer). Multiplayer missions are fun with a large amount of classes to choose from. Small, but appropriate callbacks/references to the original trilogy. Having a Ryder sibling (that doesn’t die simply because the plot calls for it). Bioware has a great opportunity to explore how the siblings’ relationship develops in expanded/future DLC content. The final mission. It’s a grand set piece that’s nicely done; you’ll wish the rest of the game had similar set pieces (at least on a smaller scale). PeeBee (your Asari squadmember) looks WAY better in-game than in the promotional trailers. Thought I’d mention this, because I had some folks feeling bummed out because of how great most Asari (including Liara as a LI) looked in the trilogy, thinking that this game made most Asari purposely uglier or something. Some of the cutscenes used to show PeeBee off in the game’s marketing are the worst examples in my opinion. Vetra (Turian squadmember). She’s like a female version of Garrus, even down to how she sounds! If you had a bromance with Garrus before but were jelly of FemSheps being able to pursue him as an LI, Male Ryders can rejoice in being able to romance Vetra. Combat. They definitely got this core gameplay component perfected. Combat is such a joy in this game, no matter how repetitive the missions become. You’ll basically be looking for any excuse to shoot up some bad guys. This extends to the Multiplayer too. Crew interactions outside of combat (whether in your Tempest ship, offworld or in various hubs). You can safely expect Bioware-signature banter to keep you engaged with this wonderful supporting cast throughout the entire game. They not only react to the world around them, they even get some character development talking with each other outside your presence (rarely seen in the trilogy). In your ship, they aren’t always chilling at the same place, often hanging with their preferred crewmates, which adds to the crew’s dynamic. As a matter of fact, Andromeda’s squad dynamics is probably the best thing about this game, being far superior to the trilogy’s cast dynamics. Andromeda’s supporting cast excels in terms of making you feel like they are alive and actual people that do their own thing. You even learn more about some of them from overhearing their conversations with others rather than talking to you. They quickly become an established presence who Ryder just so happens to have the opportunity to hang with. They help to make playing the game something to look forward to. So what did the game end up getting wrong? Noticeable performance issues (especially over time). Texture/model pop-ins & having to wait to open any door on your main ship can cause some short, noticeable lag a la Mass Effect 1. Also, remember how Bethesda’s Skyrim/Fallout games gets buggier and glitchy with a bloated save game the longer you play it? Something similar happens to this game on a PS4… it CAN break your game if you don’t have an older save to revert to. Too many noticeable animation issues that can ruin the immersion with the game. We’re talking T-Poses, lack of facial expressions for most dialogue/cutscenes (or HORRENDOUS facial expressions for some), including framerate drops when entering close-up dialogue interaction with characters. Not good for an RPG game where dialogue is a vital gameplay component of Mass Effect. Using the same animation (playing with your omni tool) to start most interactions: dialogue, opening doors, playing with objects, etc. Very annoying & immersion breaking. If you go to the options menu and choose to have helmets on for all conversations (for Ryder & the squad) when outside safe hubs, many cutscenes will STILL play with helmets off. It’s another immersion breaker. If you choose play a Strike Team Mission from your Tempest ship/APEX HQ, you will be booted into Multiplayer and will be forced to load a save from the MAIN MENU in order to return BACK to Single Player. REALLY annoying design decision here! The audio can often cut out (music/sound effects) in SP & MP. Heard this will likely be fixed in the latest patch coming out on April 6th. Character Creator is the worst in the entire franchise. It’s limited, dumbed down, with only very few presets to choose & customize your character. Most Asari in-game models have the exact same face. Many in-game models use the exact, limited head/hair presets as seen in the Character Creator. There are serious clones out there. The Galaxy Map’s “autopilot” traveling animation to individual planets/asteroids takes TOO LONG, making the Galaxy Map the worst experience in the franchise. It’s an annoying chore the hundredth time you do it and only serves to “pad” the length of the game. Anytime you’re on a planet, when you return back to your ship, you automatically LEAVE the planet and will have to use the Galaxy Map to land BACK on the surface. Very annoying immersion breaker. Noticeable perspective discrepancies. Example 1: while your main ship looks large when you’re inside it, the ship looks too small to fit a crew or a drive core when you’re viewing at it from outside. Example 2: The center of the galaxy (black hole) always appears so close to you, even when traveling to another system. Most planets (that you can’t land on) only have 1 item of interest to scan on their surface. It makes the game’s universe feel lifeless. This game should be called Mass Effect: Heleus Cluster, since you aren’t even exploring all of Andromeda anyway! Music played in your cabin will immediately stop as soon as you try to move to another area in your ship. It hurts immersion. You cannot automatically play music when you enter your cabin. You have to manually walk to your player and play a song to set the mood EVERY TIME like in the trilogy. C’mon Bioware! You’re SO CLOSE to doing this right. Squad tactics are dumbed down/almost nonexistent. You can’t manually tell your squad to execute certain powers, only tell them which target to fire/where to move to. It makes getting team combos hard. The squad AI tended to be useless until I got to level 40+. Lack of varied enemy types. Although there are 4 factions (Exiles, Roekaar, Remnant, Kett), they either have foot solders (strong/weak variants), snipers, some “tank” and/or a mini-boss. Example: A Remnant Destroyer is an almost literal reskin of an Exile’s Hydra! Most major plot points in Andromeda are primarily poor rehashes of major plot points found in the original trilogy. Example: switch Protheans with a more advanced civilization. **SPOILERS** Switch Reapers with an evil species only interested in harnessing your genes. Switch the Shadow Broker with the Collective/Charlatan, etc. Loyalty missions are mostly subpar, often with poor voice acting/writing. Cora’s entire loyalty mission is the worst example of this. The game’s tone is sometimes all over the place. It’s most apparent in loyalty missions. The writing might be super serious one moment, then humorously cringey the next. Without a Paragon/Renegade system, most dialogue interrupts in the game are pretty tame. Very little dialogue interrupts available compared to prior games. Most dialogue choices you can choose for your character tend to be “tame,” delivered in a “tame” manner. You don’t ever feel close to being able to pull off a Renegade Captain Sisko-esque character save a few key moments... just a snarky Captain Kirk, at best. Obsidian’s Alpha Protocol (of which Andromeda’s dialogue system heavily emulates), still remains vastly superior to Andromeda in this context. Dialogue pacing can sometimes get disjointed. Example: If you’re JUST starting a relationship with Vetra, she gets into “I love you” territory REAL quick. Slow ya roll! Your SAM AI companion is supposed to sound like a male, but it sounds more like a female. I didn’t even know it had a designated gender until later in the game! Your SAM AI’s speech is muffled, making it sometimes hard to understand what he speaks. If you have an AI implant that talks in your head, it should sound crystal clear rather than sound like lo-fi telephone audio. No voice narration for the Codex. They don’t give you an option to turn narration on/off, because no narration exists. It’s a shame. Texts for emails, Codex, planet scanning, omni-tool scanning and item descriptions can often be hard to read (especially if you’re playing on a TV). The game’s UI/UX designers squishes MOST text into one long paragraph, not using spacing appropriately. Backgrounds are too transparent when scanning, making reading text almost impossible unless you adjust your camera multiple times to get a proper reading. It can discourage you from checking out the game’s lore. The Nomad vehicle is garbage when traveling uphill. Driving uphill (or small roads that just slightly go upwards) makes your Nomad immediately slow to a crawl (even on the 6 Wheel Drive mode). It’s terrible. The driving physics makes exploring environments irritating, rather than fun. The Mako wasn’t even that bad at driving up small hills! The game never makes it apparent that you can upgrade your Nomad. While in your Nomad vehicle, you may accidentally confuse the vehicle exit function (Circle button) with the “Tempest Extraction” Triangle button that sees you automatically returning you back to the Tempest. It’s annoying because you don’t even get a confirmation prompt from the game to make sure you didn’t press this button on accident. Not a good design decision. The in-game compass is sometimes difficult to understand. You don’t consistently get a good sense of how far a point of interest is away from you. A custom navpoint also looks almost the same as your primary objective point. Jumping & dodging always results in a hard landing that immediately stops your movement. It makes exploring places on foot irritating. Special ammunition types (Cryo, Disruptor, Incendiary) are consumables that can only be temporarily used for 3 clips. It feels like a step back from ME2/ME3. The Research/Development menu is clunky. It’s not even made clear you can craft rank 5+ weapons/armor, UNTIL you research an item all the way to level 5. You can’t even upgrade your equipment. If you want a higher ranked armor, you have to craft a new one (wasting extra resources), then equip it at a loadout station, THEN discard your old armor to free space + get your augmentations back. Really unintuitive. You can only equip new weapons/armor pieces at a loadout station or while looting a container box/corpse’s remains. This 2nd part is a really strange design decision. If you press the “Take All” button on a loot menu, you will not be allowed to go to your inventory and change your armor/weapons until you find a loadout station. REALLY annoying in this game. The Development/Research menu takes longer to load the more you unlock items. You have no storage container. Wtf?? You either have to keep mods/armor/weapons, or you have to deconstruct/destroy them to free inventory space. The menu takes time to load character models/update level changes when viewing your squad’s skills. Some augmentations that change how your gun shoots (like one that makes your ammo ricochet off surfaces) function terribly. They can make your gun barely do any damage & become almost useless in combat. While deciphering glyph puzzles are initially fun, they get irritating quickly as they get more complex… and you HAVE to do some to advance part of the plot. Many of the game’s side quests tend to end up being a fetch quest or a “go here to kill enemies” deal (but it’s NOT as bad as DA: I). Like DA:I, there’s no real colony/settlement development. These settlements that are added after fixing an environment mostly serve as a cosmetic display to show the player that they nursed a planet back to health. Most of these problems can hopefully be fixed by a patch or two, as they seem to come as a result of questionable design decisions. The plot overall is meh and largely predictable (because a majority of it is just a rehash of the trilogy). Couple that with major choices you have to make that has the endgame feel mostly inconsequential, and you wonder where Bioware went wrong in the development process. However, there are at least a couple of very interesting side quests and intentionally loose plot threads that make the game’s future an enticing thought to look forward to. The way the game wraps up the campaign allows for SO much potential to take the Ryder siblings’ adventure to new, unexplored heights. It’s SO close to feeling like what a good Star Trek game ought to be. Performance issues that make the game glitchier over time, adding to a frustrating playing experience. Immersion-breaking annoyances that adds to a frustrating playing experience. Planet scanning/exploration that makes the game’s universe feel lifeless akin to ME 1. Andromeda doesn’t feel any different than the Milky Way in this respect. The overall plot being subpar (as it’s a major rehash of the original trilogy). Many sidequests are a “collection” errand. If Bioware tried to copy Witcher 3's quest design, they didn’t do a good job at it in my average opinion. As a result, the thought of exploring soon becomes a chore that you don’t want to do after getting to your 3rd/4th planet. Also, did I forget to mention that the game confines you to a specific cluster in Andromeda? You’re not actually exploring the whole galaxy. I feel the marketing was pretty misleading on this front. This is a Remnant Architect. There is an Architect like this for each planet you can land and settle on. Imagine that the first Mass Effect was never released in the 2000s. It had its fair share of problems and was far from perfect: driving the Mako was mostly a chore and planet exploration was pretty boring because there was very little to do on them. Finally, the first iteration of the franchise’s combat system didn’t hold up well. But, character interaction was always something to look forward to. At least the universe was so interesting and mysterious, offering a sense of wonder as Commander Shepard advanced through the plot, being able to make his/her impact on the universe in small, big ways. Mass Effect: Andromeda, if it were a standalone title, is what Mass Effect 1 would look like if it was made in 2017. Unfortunately, since we DO have the original trilogy to use as a benchmark, it’s safe to say that Andromeda does not live up to the hype or standards set by its original predecessors. To be fair, that’s a pretty high bar to reach. Don’t get me wrong; ME: A is an excellent sci-fi shooter. It’s just difficult to say that ME:A is a good Mass Effect game. Since the original trilogy, Bioware’s competitors in the RPG space have raised the bar. Witcher 3 and Horizon Dawn Zero have set new standards in the RPG genre, much like the original Mass Effect trilogy did many years ago. Even if the game’s major bugs are ironed out, Andromeda probably won’t be able to meet some people’s expectations. For a game that’s been marketing the wonders of exploring a new frontier, the end product is certainly not as exciting as Bioware made it sound (primarily due to plot rehashing limiting the game’s scope). It’s ironic, because that’s how many of the colonist NPCs in-game feel about the Initative’s colonization program. ﻿Mass Effect: Andromeda, if it were a standalone title, is what Mass Effect 1 would look like if it was made in 2017. As I’ve mentioned before, you don’t even actually get to explore the whole galaxy. Just a single cluster. The game’s marketing problems surrounding some of the graphics controversy didn’t help, as they didn’t evoke much confidence in the final product. Lastly, the writing overall isn’t consistently good as you’d expect from a Bioware title(sometimes veering into quality that could be deemed worse than fanfiction). I felt the dialogue choices available to your Ryder siblings made their personality seem pale compared to the personality you could define for Female/Male Shepards. The lack of a Paragon/Renegade system likely contributed to this feeling. Yet, Obsidian’s writers pulled off the use of a similar dialogue system much better in Alpha Protocol. Not everything is all gloom and doom about the game: the potential that Andromeda’s new direction is taking with the Mass Effect franchise is clearly there, but it’s just not fully realized in this title. Despite how negative this average joe’s take is, I will happily say this: Bioware has done a fantastic job making Andromeda an enticing, interesting galaxy that you’re just itching to explore with Ryder. You’re gonna love this squad (except for Cora maybe). I guarantee it. Don’t forget: you have a wonderful squad to stay engaged with in your entire playthrough, helping you sift through all the annoyances the game may throw at you. The multiplayer is top-notch too and worth playing for extended replay value. When the campaign wraps up, you really do end up wanting to experience what new adventures the Ryders will find themselves in this universe (hopefully through future/expanded DLC content). It’s left very open. For casual gamers, I’d say give this game a try (maybe not at the $60 price point OR until they patch it to iron out the performance issues). The most important thing to take away from this take is that Bioware, as they did with ME1, has laid a very important, but solid foundation inside Andromeda. It’s a foundation I hope they can improve upon in future Mass Effect titles. They perfected the combat. Now it’s time to focus on perfecting everything else the game introduced and has to offer. In my opinion, the success/legacy of Andromeda depends on what kind of long-term support Bioware has in store for the game. Let’s hope they offer some expanded/DLC content to continue the Ryders’ adventures. There’s so much room to tell a lot new stories, including new opportunities to explore the rest of the Andromeda galaxy. Again, the game’s potential is obviously there. I sincerely hope that this game sees success and that Bioware is learning new lessons from the game’s mixed reception. After all, Bioware had a whole trilogy to figure out how to address the franchise’s shortcomings before. The new team who handled this game should have the same opportunity to do something similar, as they continue spearheading the new direction that Andromeda has taken for the franchise.